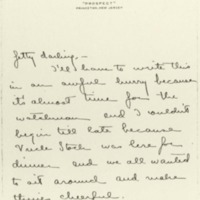 Eleanor Wilson McAdoo writes Jessie Wilson Sayre with news from Princeton, NJ. I'll have to write this in an awful hurry because it's almost time for the watchman and I couldn't begin till late because Uncle Stock was here for dinner and we all wanted to sit around and make things cheerful. He really seems quite cheerful and almost like himself. He arrived with Egie and took lunch here at the house and is going in the morning to see Dr. Durcum, and we're hoping that he will stay in Philadelphia under Dr. D's care. You see, when Mother and Egie went to Dr. Pritchard, he insisted that Uncle Stock should stay up there at Hartford—He said that it was the very best place anywhere and that the only hope of his recovery lay in his staying there and getting over this habit. But Dr. Pritchard seems to be a perfectly brutal person and, not only that, but a perfect fool who never knows when to stop talking and can't talk or listen consecutively. Both Mother and Egie took a decided dislike to him, but they thought it necessary anyway to follow his advice and when Mother separated from Egie he was to go on up to Hartford to see Uncle Stock and try to persuade him that it would be kept an absolute secret.Mother came home frightfully tired and dreadfully distressed over the brutal way Dr. Pritchard had talked about how slight the chances of recovery were. Imagine his talking to Mother like that! Then last night a telegram came from Egie saying that he thought it best to take Uncle Stock away after all and that he had agreed to take him back to Dr. Durcum. Mother was very much relieved and so were all of us. We couldn't help being glad that he was to get away from that place and I was so relieved that the responsibility of deciding was not Mother's, but Egie's. Then this morning Egie telegraphed that they would come back here together. A young man—a sort of nurse—from the sanitarium has come down with him and is to spend the night in his rooms with him, and and then in the morning the three—Egie and Uncle Stock and the nurse—are going to Philadelphia. That's all there is to tell, darlin'—This afternoon he had a long talk with Mother about everything, which was of course distressing to her, but it had to be. I'm afraid that there is going to be trouble in persuading him to stay with Dr. D, but everybody is very anxious for him to and I hope he will for a time anyway.Mother seems quite well—the darling—there never was a more absolutely wonderful person. She is so sweet and cheerful and adorable. How are you darling Jetty? Please excuse this awful scribble—I hope you can understand half of it. I went and got a cold which I stayed at home to try to break up so I wouldn't be a sight at Marguerite's to-morrow. McAdoo, Eleanor Wilson, 1889-1967, “Eleanor Randolph Wilson McAdoo to Jessie Woodrow Wilson Sayre,” 1910 December 14, WWP17458, Jessie Wilson Sayre Correspondence, Woodrow Wilson Presidential Library & Museum, Staunton, Virginia.